I have been in conversation with Tower Hill Botanic Gardens in Boylston MA about presenting my painting programs to their guests in July and August. Will let you know when exact dates are firmed up but right now we are looking at a morning program on July 20 and an afternoon program on August 6. Summer is such a beautiful time of the year for gardens, so we have decided to harvest some blooms from their gardens and capture the colors and shapes on canvas with step by step instruction from me. These classes will be geared to the beginner painter and will be perfect for anyone who has always wanted to try their hand at painting, but never did. With the wind howling and the snow falling at the rate of 3-4 inches per hour, I thought it would be a good time to hunker down and develop a new program for Different Strokes. This one was a very popular class that I offered to my clients at the Doubletree and I hope you enjoy it as well. 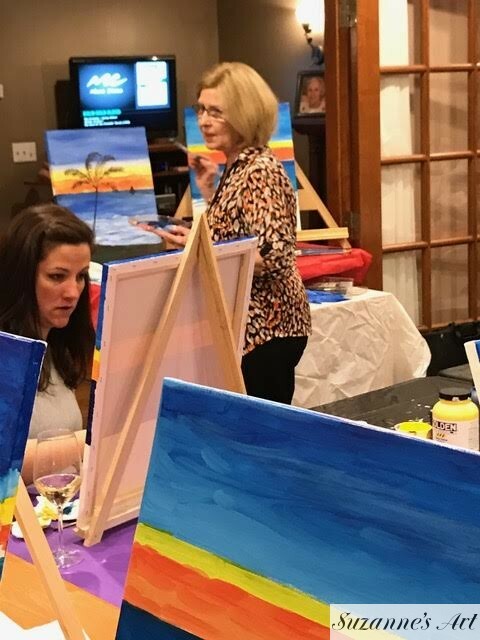 There was a great turnout for the Painting Party last night for the benefit of Kids Connect in Natick. The event was hosted at the home of Pam Harris and the Painting Party was presented by Suzanne Foxwell of Different Strokes Painting Program. Refreshments were served and then attendees got down to business painting a tropical scene with beautiful blue waters and a palm tree. Great job everyone and thanks for attending!